We are changing things up a bit for the 2019 Spring Education Day! Not only are we moving the event from May to April but this year’s event will feature a Wednesday Trivia Night fundraiser! Thursday will feature an amazing speaker line up and all events will be held at the stunning, newly renovated, Ingleside Hotel in the Waukesha/Pewaukee on April 10-11. We are excited to announce we will again be offering complimentary planner member registration for the second year in a row! Thanks to the support of our chapter’s Strategic Partner program our Spring Education Day will be more accessible to our members, specifically our planner members. We’ll be kicking off on Wednesday evening, April 10th with another NEW and exciting event for our chapter - Trivia Night! Sponsored by Memphis Tourism and Ingleside Hotel, this won’t be the typical Welcome Reception…get ready to test your knowledge on a broad range of topics; everyone will have their opportunity to shine. Simply show up with your thinking cap on and get amped in the hometown of Les Paul, solid-body electric guitar pioneer. On Thursday we will take all the energy from our amped up evening the night before and enjoy a full day of education - sponsored by Visit Baltimore. There will also be some time for our community outreach efforts with this year’s partner, the Wisconsin Humane Society. We look forward to supporting our furry little friends! Tradeshow Industries and What It Means for You! Free Registration for MPI Wisconsin Member Planners! MPI Wisconsin Planner Member registration is being sponsored this year by our 2019 Strategic Partners. Their year-round support of our chapter allows us to make this offer possible. Please thank our 2019 Corporate Partners when you see them. We are excited to be holding our first annual Trivia Night! Join us on Wednesday evening, April 10 at the renovated and re-imagined Ingleside Hotel in Pewaukee, prior to our Spring Education Day. 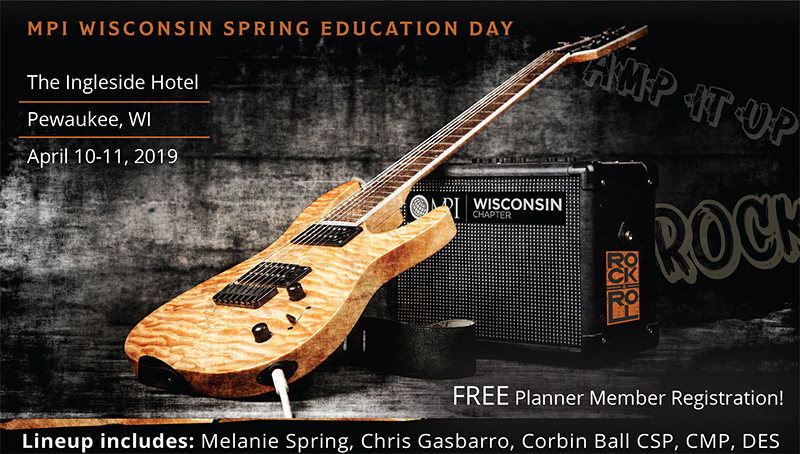 This is a great opportunity to connect, meet other MPI-WI members and enjoy a fun-filled kick-off evening prior to our outstanding Spring Education Day. Trivia Night’s competition will feature a broad range of topics including movies, celebrities, sports, and fun facts about our sponsors. We know that MPI members are brilliant. Here is your opportunity to shine! Special thanks to our Trivia Night Title Sponsor - Memphis Tourism! Registration is only $25 and the evening will also include an MPI-WI reception with food, cocktails, silent auction, prizes, and more! Please help support our 2018-19 Community Outreach Partner, the Wisconsin Humane Society. We will be getting hands on for our Community Outreach Activity at Spring Education Day to help WHS by making fleece tie blankets! The WI Humane Society will also have a booth and will be accepting pet food, pet toys, cash or credit card donations on-site.